Garry Spencer of Tampa has had a long relationship with OMC, going back to when he was a child and his father, Chap, was an Evinrude Sales Representative. Garry has a wealth of historical knowledge, interesting stories and many pictures that he is willing to share with us. Watch for more! Garry writes: " I have lost the original captions (to these pictures). They don't make archival scotch tape. I'm sure the one with "Doc" on his shirt is Doc Jones, and the driver, I believe was Hu Entrop. The date was March of 1960. 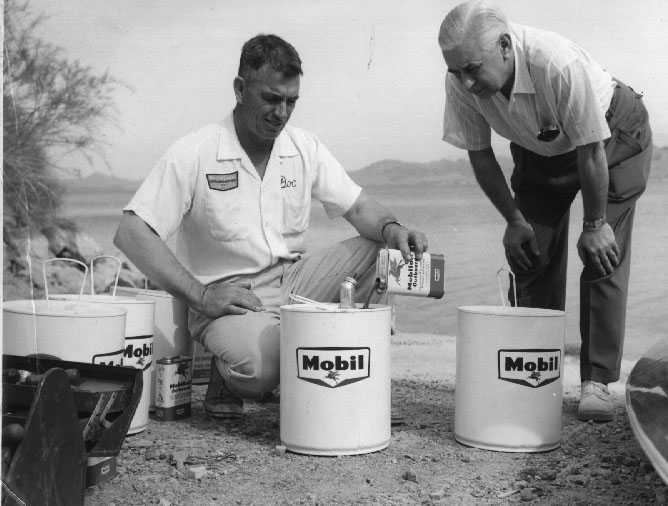 The APBA inspector certifying the gas and oil used, but it looks more like a plug for one of the sponsors. The record was set, and the challenge was taken by Mercury, and retaken by Evinrude. 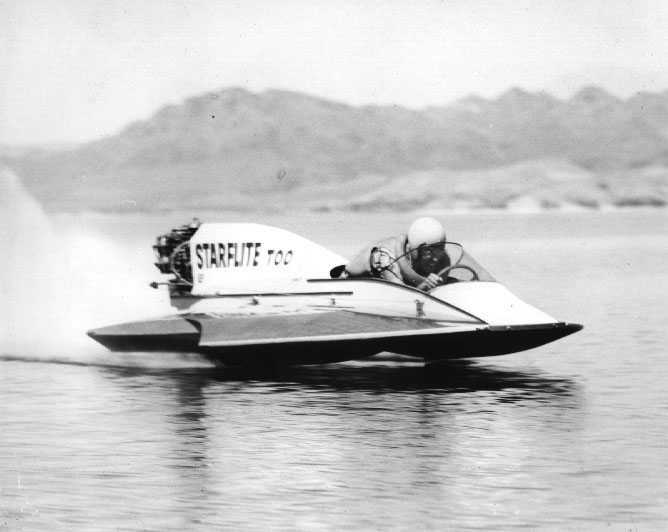 But the fastest Evinrude is not in the record books. The driver was killed on the return run. Everyone agrees, breaking the record has just become too dangerous. 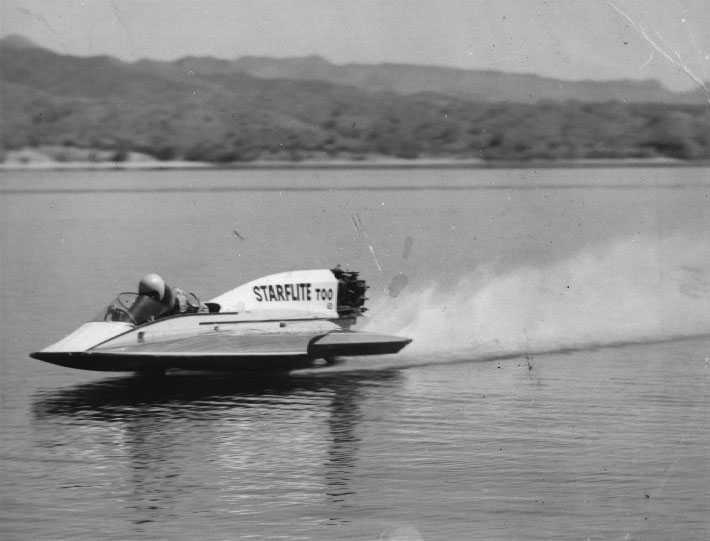 Doc Jones was the Evinrude Dealer in Arizona that sponsored Hu's run on the record. When Evinrude re-engineered the "Fat Four" of '58 into the smooth running 75 of 1960, it didn't go as fast as engineering had hoped. They had tried Fuel and Oil injection, But the technology was not ready. And so it was a carbureted version that was delivered. Hu Entrop saw the potential of a world speed record. 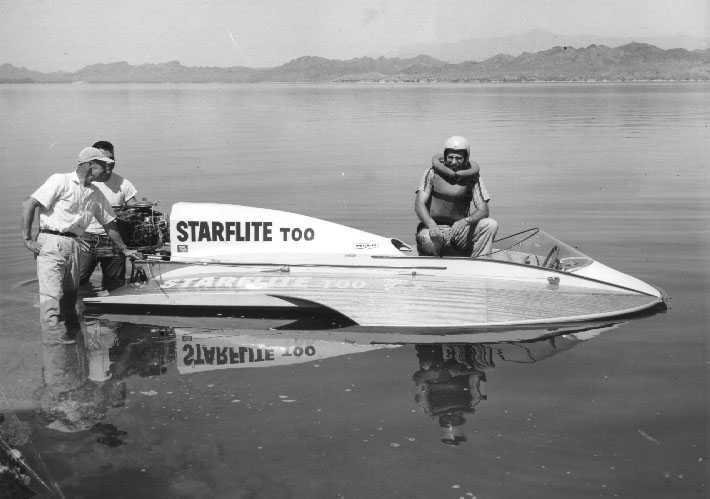 He had seen Carl Kiekhaefer take his hotrod super ten and make a real head turner by adding his Quicksilver 1 to 1 lower unit and thought, "What if..." Hu took his ideas to "Pep" Hubbell, who had manufactured many racing parts in his California shop. 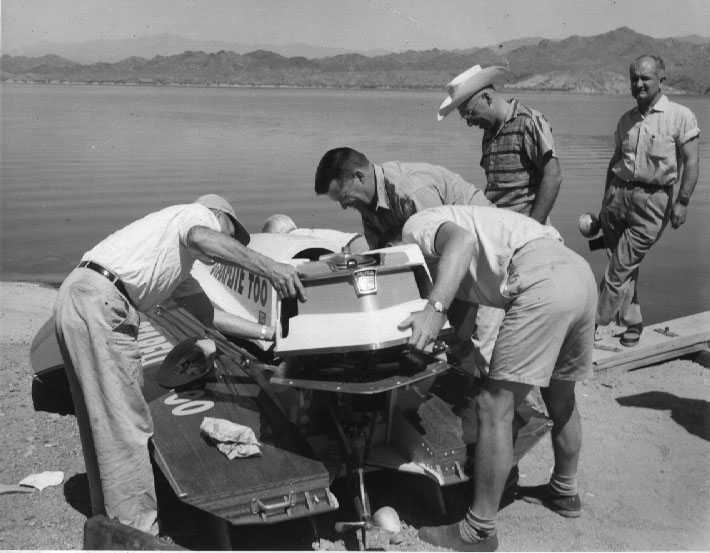 They came up with an over drive racing gear case and short transom bracket for the powerful V-4. 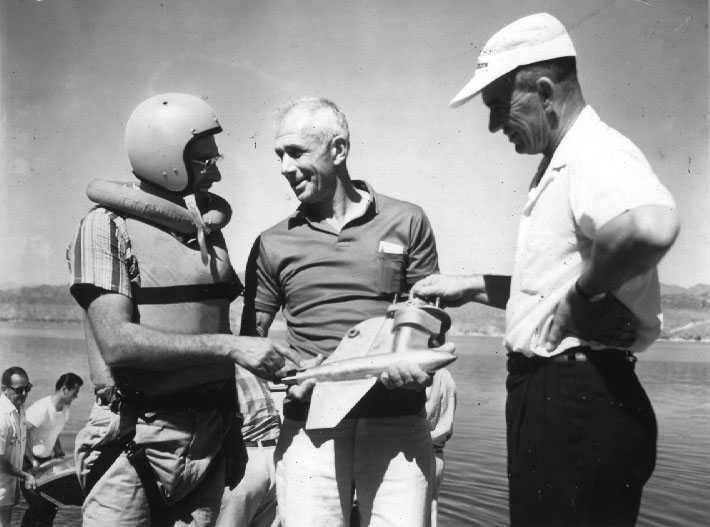 A suitable three pointer was designed for the rig and Lake Havasu chosen for the record attempt. This effort culminated in the setting of the 114.65 MPH two way average speed over a measured kilometer. splash of each propeller blade as it chops into the water. A real tribute to the engineering that went into this successful record run. 132. In a later attempt the boat went out of control and was destroyed. crack the 200 MPH barrier, but ANY error would surely be fatal.